Militant activities or militancy are on the downside in the North-east according to a recent Union Home Ministry report. The report further stated that among the north-eastern states, Tripura and Mizoram emerged as the most peaceful states in the region. According to the report, the seven states in the North-east, excluding Sikkim, registered a total of 308 militancy-related cases last year compared to 484 in 2016. The trend also shows a steady decline. In 2015, there were 574 insurgency-related cases reported while the year before registered as many as 824 incidents of militancy. 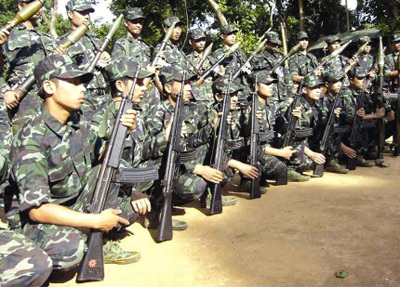 Last year, Tripura and Mizoram reported no insurgency-related incidents. Manipur, with 167 cases of militancy reported last year, has been dubbed as the most disturbed state. Incidentally Arunachal Pradesh recorded the second highest number of insurgency related cases last year with 61 reported incidents. However, most of the cases are related to insurgent groups from neighbouring Assam, like the United Liberation Front of Assam-Independent (ULFA-I) and the Songbijit faction of National Democratic Front of Boroland (NDFB). Assam stood at the third position with 33 reported incidents of militancy related incidents. Meghalaya and Nagaland going for their respective Assembly polls on February 27 next registered 28 and 19 insurgency-related incidents respectively last year.